Description: The angler fish is unlike any other fish encountered in the waters around Britain and Ireland. It has a large flattened head with a wide semicircualr mouth and inward curving, pointed teeth. Behind the head the body tapers to a short, thickset tail. There are a number of separate, elongate fin rays on the back of the fish. The first of these is the longest and terminates in a fleshy lobe. It uses this as a kind of fishing rod and lure to attract its prey, hence its common name. The pectoral fins are large and broad and the pelvic fins are small and are located on the underside of the head. A border of fringed lobes surround the head and body. 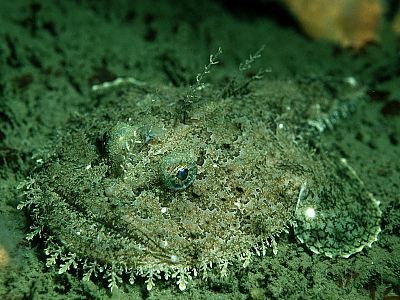 The angler fish is very good at camouflage and the colour varies to match that of its surroundings. Adults can reach a maximum length of 2m but most are between 50-100cm. Habitat: The angler fish occurs sublittorally from 2m to over 500m in a wide varity of habitats. Distribution: This species is common all around the coasts of Britain and Ireland. Similar Species: The angler fish is unlikely to be confused with any other species. First dorsal fin is separate and elongate with 'fishing-lure' on end. Picton, B.E. & Morrow, C.C. (2016). Lophius piscatorius (Linnaeus, 1758). [In] Encyclopedia of Marine Life of Britain and Ireland.